This time of year can be extremely challenging for little ones and their immune systems. With the holiday chaos just now ending, trying to get back into a normal routine, along with recent weather changes, hearing about kiddos getting sick is not uncommon. While many times people look at the outside factors that make them sick, the real issue is the body’s inability adapt and fight back. Factors that put stress on our system (physical, chemical and emotional) build up, and when the bodies have had enough, our stress response is kicked on. Physical stressors in little ones: physical stressors could be anything from baby’s positioning in mom’s belly, to stress from sitting in the car seat or baby carrier. Chemical stressors are toxins from the environment, from clothing, pesticides or chemicals in food, different products that we use daily and much more. Emotional stressors could be changes in routine, relationships at school, family dynamics at home or any other situations that can add extra stress to a situation. Instead of letting stress build up and and make us sick, it is important to be proactive! The body was made to be able to adapt and fight from the inside out! 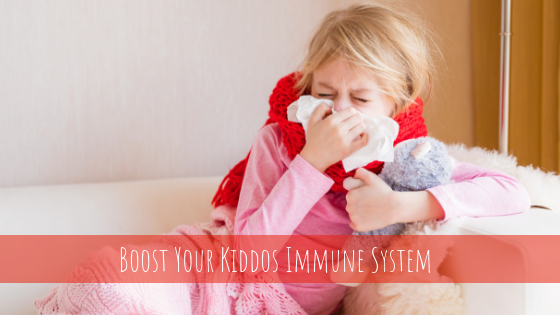 Below are some tips for boosting your kiddo’s immune system! – vitamin D is important for boosting the immune system, boosting mood and so much more! A couple of sources of vitamin D are sunlight and fish, like tuna and salmon. 2. Exercise: Get those kids moving! Exercising helps with energy levels and also boosts mood and the immune system! Studies have shown time and time again that sleep is so important for a healthy immune system. People who do not get enough sleep are more likely to get sick when exposed to a virus. They also take longer to get better after becoming sick. Don’t wait until you are sick, be proactive! Studies have shown that people who get adjusted regularly are 60.2 % less likely to be admitted to the hospital, they spend 59% less days in the hospital if admitted, the have 62% less the amount of outpatient surgeries and they spend 83% less on pharmaceuticals. So many of our families comment on how they have been able to avoid cold & flu season this year or are recovering much faster than previous times! If you have any additional questions about how chiropractic care can help the immune system feel free to give us a call! We love being another resource for our families! A Premier Chiropractic experience for the entire Family. SW Corner of Happy Valley Rd. & Lake Pleasant Pkwy. © 2019 Ignite Family Chiropractic.